I’ve always loved an off-format episode, from Star Trek: The Next Generations’ “Lower Decks” to Buffy The Vampire Slayer’s “Hush” to Boy Meets World’s “And Then There Was Shawn.” One of the best things about television is its fluidity; a TV show can be something entirely new for an hour or two without blowing up its premise. And that novelty can add a much-needed jolt of energy to a familiar world. That’s especially true for shows that are designed to be binge-watched. If I’m being honest, the first three episodes of Luke Cage are already starting to blend together. But “Step In The Arena”—which is almost entirely a flashback to Luke’s origin story—is completely memorable as an episodic entry. To some extent Luke Cage entered the Marvel Cinematic Universe fully formed. Sure he’s not a full-fledged crime fighter yet, but in both Jessica Jones and this series, he has a strong grasp on his powers and a relatively strong sense of self too. Now 10 episodes in (counting his Jessica Jones appearances), we finally learn how Luke Cage became Luke Cage. Or, rather, how Carl Lucas became Luke Cage. A former cop thrown into jail for a crime he didn’t commit, Luke’s origin story is a heartwrenching, grueling one to watch. In the first episode he’s really been asked to carry on his own, Mike Colter turns in his best performance to date. He captures the excruciating agony Luke feels at the prospect of a life behind bars. “I’m just trying to survive,” he bellows after two men (including Cottonmouth’s partner Shades) jump him in his cell and the guards come to take him down. Though we still don’t know exactly what led to Luke winding up in Seagate Prison in the first place, we know it involves a betrayal of some kind. And that sets Luke on a path of isolation that still haunts him to this day. His initial prison survival strategy is to completely quarantine himself from those around him. It takes a warm psychologist named Reva and a friendly inmate named Squabbles (Parisa Fitz-Henley and Craig Mums Grant, turning in two more fantastic ensemble performances) to pull Luke out of his shell. Once again, Luke Cage does a wonderful job of building relationships through casual conversation, like the way Luke and Squabbles banter about Bruce Lee vs. Jet Li and Lisa Bonet vs. Zoe Kravitz. Plus Reva finally moves from an abstract loss to actual human being with a complicated and mysterious backstory of her own. Colter and Fitz-Henley have phenomenal chemistry and I hope the show winds up returning to their relationship again in flashback form. Of course, just as Luke feared, his relationships wind up being used against him. In exchange for protection for Squabbles, he’s coerced into joining a seedy prison fight ring run by the guards. Though he’s good at the fighting—which he originally framed as a form of slavery—it only makes him more and more despondent and withdrawn. It also reveals a shockingly aggressive side of Luke, one we haven’t really seen before in his more passive present day fighting style. The flashbacks adopt a slightly more heightened comic book tone than the preceding episodes, which mostly works until the climax, when the “Step In The Arena” rushes through a rather perfunctory origin story for Luke’s actual powers. His plan to end the tyrannical reign of Officer Rackham backfires, Squabbles is killed, Reva flees, and Luke is nearly beaten to death before Dr. Noah Burstein sticks him in some goo that gives him super strength. It works as far as these things go, but it’s definitely the weakest part of the episode. But on the whole, “Step In The Arena” does a remarkably successful job of recontextualizing Luke Cage. Just the reveal that he used to be a cop (which I’m 99 percent sure we didn’t know before) changes a lot of our understanding of him. He might reject the idea of being a public protector now, but he was once called to public service. Of course, as much as Luke has changed, he’s also stayed the same. His friendship with Squabbles confirms he’s always had a strong sense of protectiveness and loyalty. And his relationship with Reva proves he’s always been willing to open up to those he truly cares about. Though it spends most of its time in the past, this episode feels like a huge step forward for Luke Cage. And we know there’s no direction Luke likes better than moving forward. Standout moment: Let’s talk about Luke’s insane prison beard, which obviously needs to be addressed in its own space. He starts as Cutty from The Wire, morphs into Questlove and is approaching full-on Frederick Douglass by the end. 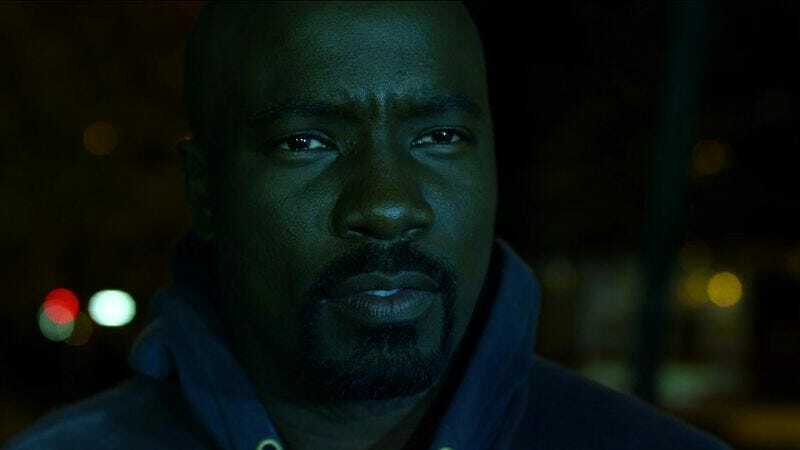 Also there’s no way in hell a couple disposal razors produced the clean-shaven Luke Cage we know and love today, even if his unbreakable skin means he doesn’t need shaving cream. Marvel Cinematic Universe connections: I had to look this one up, but Seagate Prison is also the setting for the Marvel One-Shot short film “All Hail The King.” It’s where Iron Man 3 villain Trevor Slattery and Iron Man 2 villain Justin Hammer are housed. Plus the USB stick Reva has at the end of this episode plays a big role in Jessica Jones. Burning question: So his last name is Lucas but he took the name “Luke” from the Bible? I’m calling shenanigans on that one.